Picasa Web Albums has many new features. * Uploading videos. Until today, only users that paid for extra storage could upload videos. Now anyone can do that, but only using Picasa. 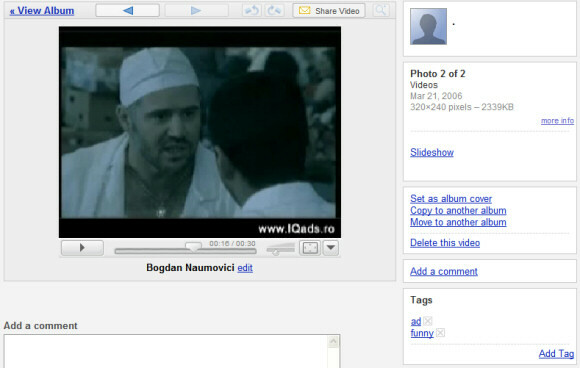 Another option is to use Google Video to upload unlisted videos. * Prints. You can now order prints for your photos, but number of options is small. * Tags. 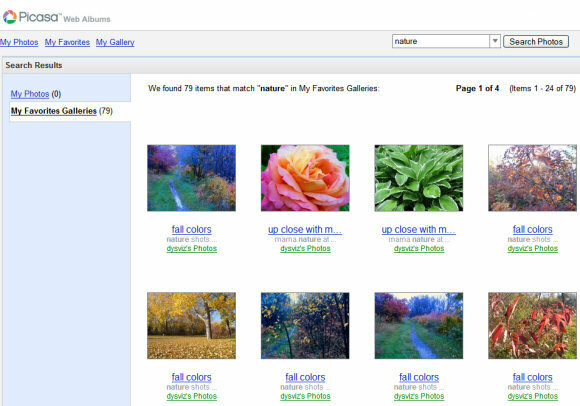 Picasa Web Albums lets you tag your photos. You'll find the option in the sidebar. * Search. You can search your photos, a certain gallery and your friends' public photos. Google indexes captions, tags, album titles, album descriptions, and album locations. If Google adds ratings, date search and photo editing, I can say Picasa Web Albums is almost perfect. Until today, only users that paid for extra storage could upload videos. Now everyone can do that, but only using Picasa. Is it possible for picasa to automatically fetch photos from my gmail account without me having to manually download them to my computer myself? Photo editing? Um, isn't that the primary function of Picasa? I don't see why you would even want to edit photos on the remote web album if they came from your Picasa desktop application in the first place. I wonder how Picasa Web Albums can be "perfect" being so expensive! Please Google people, look Yahoo! to learn how to care for photo lovers. Yahoo: unlimited space, family-friendly features, all free. Flickr: unlimited space, unlimited resolution, outstanding community, only $25/year. Now, Google, try to sell tiny space for $25/year. Outrageous. When I said "almost perfect" I didn't consider the price. I agree that 250 MB is kind of little, and I hope Google increases the space. Some interesting discussion about photo storage solutions can be found here. I think Smugmug offers the best value for $39 a year. Using the tags feature online is not very user friendly. Auto completion is not that hard to implement (already seen in Google suggest). ummm.. I was amazed when read about $25 for Picasa. Are you talking about Picasa Web Albums? I am using it for free now, or maybe I am wrong. Correct me, please, or tell me more about it. For $25 a year, you get 6.25 GB. The free version only has 250 MB. You can see other upgrade options here. Frankly, who has a collection of only 6.25 GB of photos? Not true photo lovers, maybe casual snapshooters. Compare the same price x year ($25), flickr: unlimited space, unlimited resolution, unlimited bandwidth. I think Google is losing this battle. And I am sorry, because overall I prefer Google to Yahoo services. If an average photo has 512 KB, you can store 2*1024*6.25=12800 photos in 6.25 GB. If an average photo has 2.5 MB, you can store 2560 photos in 6.25 GB. Alex, thanks for your patience. I can do the math, but still I find a shame 6.25 fixed amount for $25 a year!, if at least was for one single $25 payment since the space they sell is limited! But no, they charge you every year for a fixed amount which is nothing. Yes, nothing. I have many thousands of photos, and just look the photo file Mb of any regular digital camera. You soon end up with many Gb of photos! And they keep accumulating if you keep shooting, so what's the photo storage model offered by Google, who is their target costumer? Not people who shoot several Gb of photos every year, and not even talking of pro-shooters. Why do you think flickr upload limit was 2 Gb per month, within an unlimited space plan? And now they just have removed the monthly limit, so it is unlimited upload for unlimited space, for the same price Google charges a very limited space. I can't come to terms with this fact, being a Google fan. I don't recommend you or anyone else to pay for more storage. Comparing the free versions of Picasa Web and Flickr, I think Picasa Web is better for sharing photos with your friends / family, while Flickr is better for sharing your photos with the world. I'm sure Picasa Web Albums will continue to improve and will eventually remove the limitations or, at least, increase the storage. There is no bulk tagging support in picasa web albums yet, which makes tagging really tedious. Also, picasa the desktop software deoesn't support tagging yet, which isn't understandable either. Can somebody tell me the current monthly bandwidth limit of picasa web (free account)? I can find any information about it. Is it unlimited?